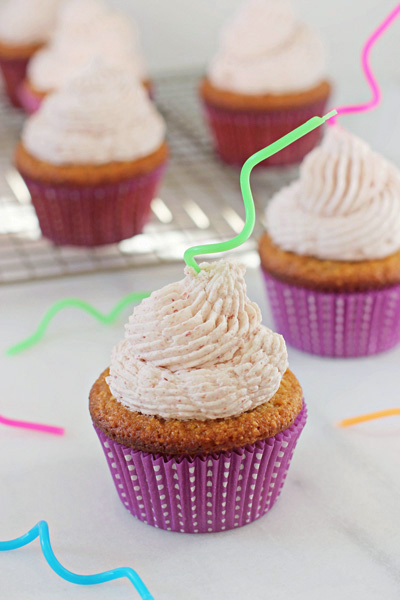 Soft and fluffy almond flour cupcakes! This easy recipe is a delicious option for a gluten free dessert! And no need to get out the mixer – just a few bowls and a whisk required! Happy almost birthday to my little sister!! I made these cupcakes for a small party a few weeks ago at my parent’s house to celebrate the fact that she’s getting “old” – as my sister likes to say. Never mind that she’s quite a few years younger than me and is not even close to turning 30. Anyway, because she needs to eat gluten-free, I was a little worried about making the dessert for her celebration. I definitely do not eat gluten-free and don’t have a lot of experience when it comes to gluten-free baking. I toyed with a few recipes but decided that this one was my favorite. And while I don’t have much to compare these against, they definitely got the seal of approval from both my sister and my mom (who have sampled a number of gluten-free cupcakes over the years). They described the cupcakes as light and fluffy (especially for gluten free baked goods! ), while also perfectly soft and moist. I’ll count that as a win. Even I really enjoyed the flavor of these cupcakes, which are full of vanilla and have just a hint of lemon to give them a bit of brightness. Another bonus? No need to get out the mixer to whip these up. Score! First things first. I mention this down in the recipe below but it is worth repeating. I would highly encourage you to allow the eggs to come to room temperature for these cupcakes. If they are not at room temperature, there is a chance that they can cause the coconut oil to harden up – which will affect the consistency of your batter. So play it safe and bring them to room temp! Let’s talk measuring our your almond flour. Scoop the flour into your measuring cup with a spoon and then level off with the back of a knife. Don’t dunk your measuring cup straight into the bag as you’ll likely use too much! Which will also affect the consistency of your batter. Along those lines, I would encourage you to stick with the listed blanched almond flour (and not use almond meal instead). Blanched almond flour is usually a bit finer ground than almond meal and helps to create a lighter and fluffier texture. These cupcakes are a solid base for whatever frosting your heart desires. 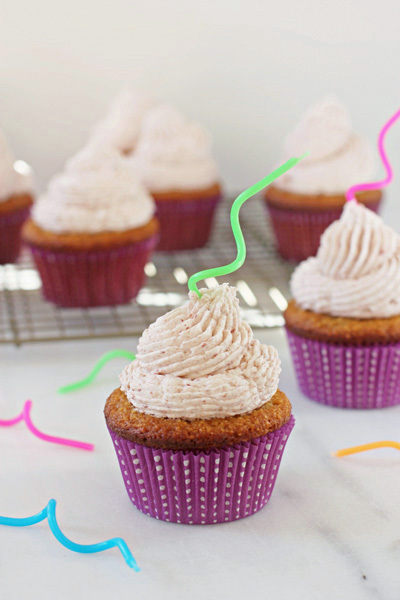 They would go wonderfully with this strawberry buttercream. Or maybe I can interest you in a chocolate buttercream or even vanilla bean? Perhaps a dairy free coconut milk frosting? Pick your poison! Additional Gluten Free Dessert Recipes You Might Enjoy! 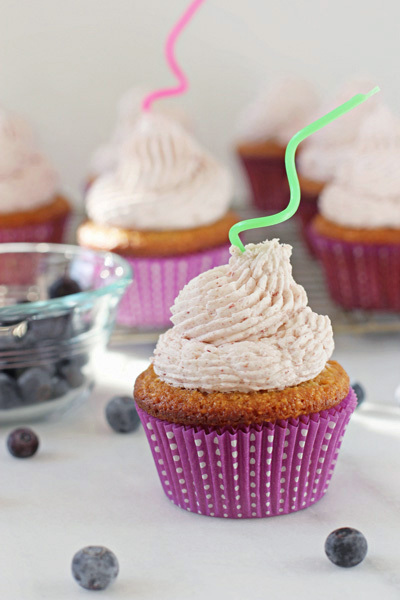 Recipe for almond flour cupcakes. 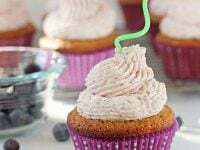 An easy, delicious option for a gluten-free cupcake. Full of vanilla and with just a hint of lemon for brightness. Preheat the oven to 325 degrees. Line a 12 cup muffin pan with baking cups and set aside. In a large bowl, whisk together the almond flour, baking soda and salt. Set aside. In a medium bowl, whisk together the melted coconut oil, honey, eggs, vanilla extract, almond extract and lemon zest until combined. Add the wet ingredients to the bowl with the dry ingredients and mix until combined. Pour or scoop the batter evenly into the prepared cupcake tins. Bake for 22 to 25 minutes, until golden brown and a toothpick inserted into the middle comes out clean. Let the cupcakes cool in the pan for about 5 minutes, then remove to a wire rack to cool completely. **Updated June 2018 – if your eggs are not at room temp, there is a chance that they could cause the coconut oil to harden up (and then the batter will be a different consistency). While this doesn’t always happen, let them come to room temp to avoid any issues! Slightly adapted from Edible Perspective.